Is your holiday home listed on Airbnb, FlipKey or any other vacation rental site? And do you have an own WordPress website as well? Then save time with this plugin! 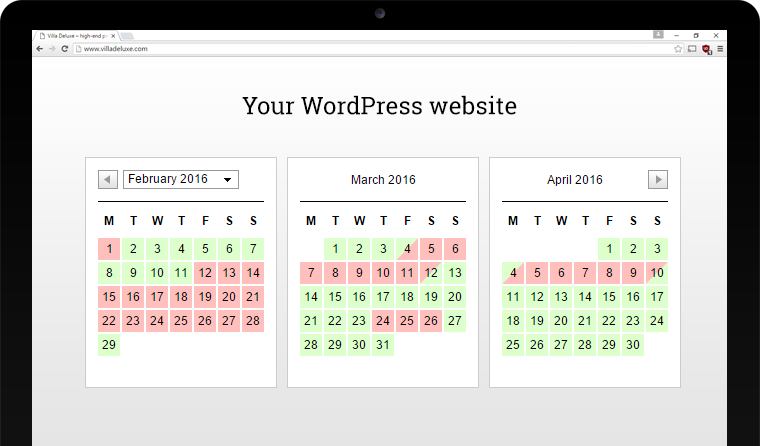 Insert an availability calendar into your WordPress website with just one click and let it update via an iCal feed which you get from Airbnb, for example. How often does the calendar update? What is the sync interval? It depends on the feed. Most sites update their feed every 2 hours. Can I import/merge more than 1 feed into a calendar? Yes, with the Premium version you can import multiple feeds. What happens if day X is booked in feed Y, but available in feed Z? Booked days always have priority. So if day X is booked one of of the feeds, that day will show as booked. Do you need support or do have a question for us? Click here to contact us.